See why there’s no bull about our beef. At Shogun, our Hibachi is second to none! Come watch fresh ingredients being cooked to perfection! Shogun is Bowling Green’s best source for top quality hibachi and sushi. 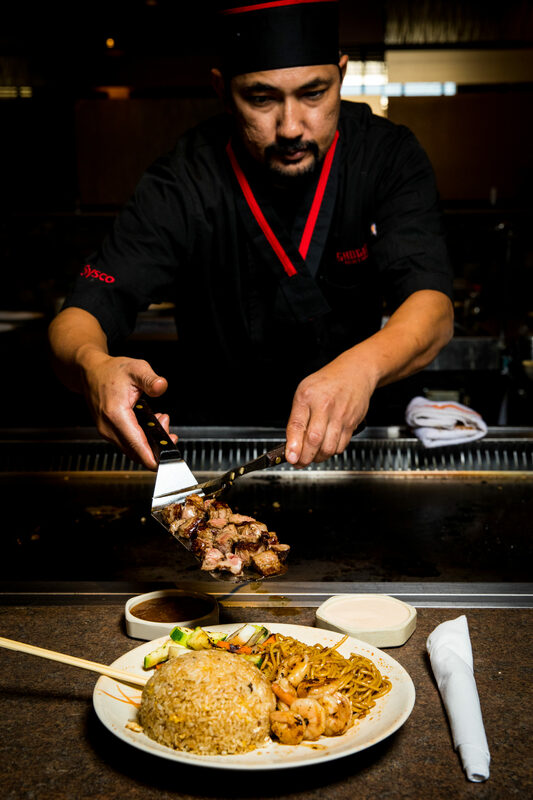 Bring the family and friends down to Shogun and gather around a sizzling Hibachi table to watch your chef put on a memorable high-energy culinary show. Your food is prepared in front of you by one of a team of young, enthusiastic and extremely skilled chefs. View our menus below. Want to share your experience? Leave us a review. Our waitress was good, and our Chef Justin was the best we’ve ever had, he done an amazing job. Very funny, very entertaining and cooked amazing food. You can tell he loves his job and cares about the customers experience. I highly recommend requesting him even if you have to wait on him. I go to Shogun Bistro every time I’m in Bowling Green I always receive great service and the food delicious, my favorite place to eat. Shogun offers traditional Japanese hibachi and sushi, combined with the unique and diverse menu of a fine dining, Bistro-style restaurant. Contact us today to find out about our menus and specials, or simply come on in and enjoy our food!